My second most anticipated film of 2013, “Stoker” is a coming of age tale packed with serious bite. The main reason for my anticipation is the fact that this is Park Chan-Wook’s latest directorial outing, which also happens to be his first Hollywood production after a string of amazing films from his homeland of South Korea, such as “Oldboy”, “Sympathy For Mr. Vengeance” and “Thirst”. As always, when Hollywood producers lure great foreign directors, the biggest worry is whether or not they will be allowed to bring their own sense of style with them or will they be forced to conform within Hollywood’s conventions thus negating everything that made them special in the first place. A perfect recent example of this is from Park Chan-Wook’s fellow countryman, Kim Jee-Woon and his experiences making the Arnold Schwarzenegger- starrer “The Last Stand”. While that film turned out to be entertaining in its own right, anyone familiar with Kim Jee-Woon’s previous work would be easily able to recognize that the director’s influence was seriously watered down. Would Park Chan-Wook suffer the same fate with “Stoker”? Early trailers indicated that this was not the case at all, but how did the film stack up viewed as a whole? On the day of her eighteenth birthday, India Stoker’s life is turned upside down when her beloved father is killed in an automobile accident. Her life is further disrupted at her father’s wake when she is introduced to a man, who before that day, she never knew existed; her Uncle Charlie. A full time traveler of the world, Charlie has returned home to lay his elder brother to rest and bring comfort in this time of need to the family he barely knows. Being a time in India’s life that she really needs the guidance of her father, Charlie takes over that role, but as he becomes more and more relaxed in these unfamiliar surroundings, his true nature starts to come to the fore. His focus and attention on his young niece becomes increasingly intense, to the point that Charlie’s true motivations are questioned, as well as whether or not he is even the person he claims to be. While I do not think that “Stoker” is as bold or as memorable as the films he made in South Korea, Park Chan-Wook’s latest is definitely a success. Admittedly the opening few minutes of “Stoker” are a little clunky and clumsy, but once Charlie enters the film in earnest, things settle down and everything starts to flow beautifully until we reach the disturbing finale. Thankfully, “Stoker” is instantly recognizable as being the work from its talented director; there is nothing watered down here about his vision. Park Chan-Wook’s bold visual style remains intact, which is largely due to the fact that he was able to bring his regular cinematographer, Chung Chung-Hoon, with him on his journey to Hollywood. The two have an amazing chemistry together and have created yet another masterpiece of visual delights. Almost every frame of this film is a thing of beauty with camera movements and compositions being akin to a work of art. I loved the fact that even though the story is pretty dark in tone (and quite perverted too), the visuals were anything but. Everything is well lit and easy to see what is going on. Once again I felt an influence from “Valerie And Her Week Of Wonders” (another brilliant coming of age film) in the visuals of this film, that I am now certain that Park Chan-Wook is a massive fan of this film. Another thing that I loved is the fact that Park used a lot of symbols in the film without shoving them in your face. Things such as India’s shoes symbolizing her growing up (culminating in the high heels she receives at the end of the film), to the fact that Park even gave the characters of Charlie and India animal totems, with Charlie being the fly and India, the spider. These are things that if you do not notice while watching the film mean little, but give the film an extra depth when you become aware of them. On the acting front, Park has been blessed with three generations of Australian actresses playing the main female roles, and all of them are outstanding. Nicole Kidman is great as Evelyn Stoker, India’s mother, and she plays her with a hint of desperation and sadness all at once. She is definitely a woman looking to be loved, and hurt by the fact that her daughter shows her little of it (India is the definition of a “daddy’s girl”). There is a fragility and frankly, a patheticness to Evelyn that Kidman just nails so perfectly. While she only has a handful of scenes, Jacki Weaver almost steals the film with her portrayal of “Auntie” Gwendolyn Stoker. She is the one character who seems to know the truth about Charlie and because of this you can feel her nervous energy whenever she is around him. I really was so impressed by Weaver’s performance here; she just brings a much needed level of reality to this story, and gives the film its weight as through her character we suddenly come to understand just how serious and dangerous the situation could soon become with Charlie. 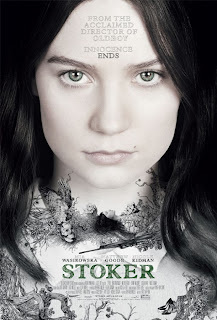 Of the three Aussies on display though, it is lead actress Mia Wasikowska’s turn as India Stoker that most impresses. I have been a fan of hers from day one, but this is my favourite portrayal from her yet. She brings an uneasiness to India; you can feel both her innocence and her awkwardness at being an outsider. India is someone who just doesn’t fit in with a crowd and Wasikowska portrays this brilliantly. She also is able to imbue her performance with the subtle darkness needed so when India comes of age and embraces her true nature, it does not feel forced at all. The role of Uncle Charlie is played by British actor Matthew Goode, who does an admirable job with the role. He is smarmy and charming in equal measure, but there is also a feeling that this is a man that could explode into great violence at any given moment. What I did like about Goode’s performance is the fact that he often portrays Charlie as a man who has never really grown up. He is almost like a kid in some scenes, particularly with some of the goofy facial expressions he displays and the way he reacts when he doesn’t get his own way; almost as if he is throwing a tantrum. A good example of this is the flashback between Charlie and Richard (India’s father) in the car. It is just a touch of brilliance that in a film that is essentially about growing up, and his character is helping India to grow up and discover who she really is, that Charlie himself has never grown up. One thing that I want to mention is both the use of sound and music in “Stoker” which is extraordinary. Park Chan-Wook uses the soundscape brilliantly to contribute to the uneasy atmosphere of the film particularly by drowning out certain sounds and enhancing others. A great example is the use of the metronome in a scene midway through the film. Not only does it give the scene a beat or rhythm, it ratchets up the tension considerably. In regards to music, I think Clint Mansell’s score is just beautiful and thankfully never overused. It just enters the picture when needed to highlight certain moments rather than bluntly bashing us on the head and telling us how to feel. The other musical piece of note, is Phillip Glass’s piano duet that India and Charlie play together which is just magical and the highlight of the film. So are there any faults to the film? Well, that is hard to say. For me it is a film that I love in the moment when watching it (I have now seen it twice already, with my third viewing later this week at MIFF), but strangely it doesn’t really stay with me once the film is done. After having a brief conversation with a friend about the film earlier this week, she felt that there is a lot leading up in the film for not much payoff. I guess there is some validity to this opinion because I agree that it always feels like the film is going to end on a grander note; that it is building to something so much more than it delivers. As a result of this, it feels like the film never soars. It hits its peak early and stays consistently at that level rather than building and building to the expected crescendo. Personally, I feel this is the fault of first time writer Wentworth Miller. While Miller delivers a good script here, the structure of certain scenes just feels a little off, and this is particularly true of the ending. 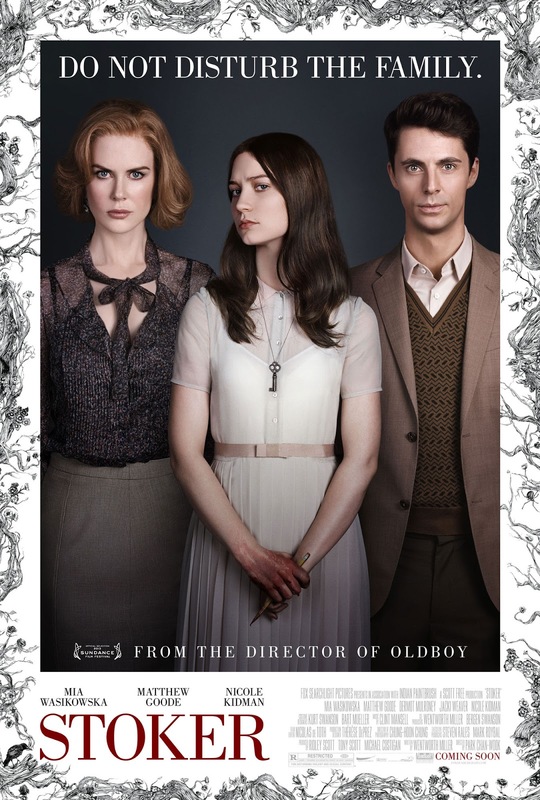 Overall though, I found “Stoker” to be an enjoyable movie experience particularly due to Park Chan-Wook’s directorial brilliance and the performances from the three Australian women. While the film is filled with disturbing themes and moments, Park never sensationalizes them, rather he handles them maturely and thus stopping “Stoker” from becoming the exploitation film it may have become in lesser hands. Still, Park Chan-Wook is no stranger to disturbing content (hello, “Oldboy”) so I guess this is to be expected. The visual style is, no surprise, amazing but if the film does have a problem it may be its momentum towards its finale. No matter, this is still a film that I can see myself revisiting a number of times in the future and have no problem recommending. ** I just want to note that I have deliberately neglected to mention certain plot points of the film to enhance the viewing experience of anyone who plans to watch “Stoker”, as it is definitely a film that works better the less you know going in.